Washington State artisans challenge the limits of molten glass with new ideas and designs, expertly creating pieces. 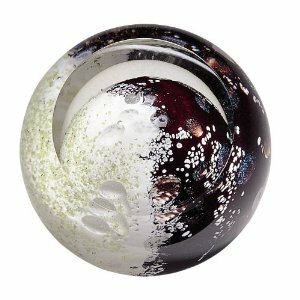 A marriage of science and art, this Glass Eye Studio celestial paperweight reveals the intricacies and mystery of the planet Mercury. A planet with extremes, the bright side of Mercury can be hot enough to melt lead while the polar regions dip to 235 degrees below zero. Planet Weights are presented in a velvet box with story card, signed and dated. Handmade in the USA - contains ash from the 1980 Mt. St. Helens eruption. Approximately 3" diameter.